My first one may seem simple but it is well worth trying yourself, just go to a hobby/craft shop where you can buy these stick on eyes you see in the image and stick them on your own peddle bin at home at watch as it almost seems to start smiling! To those that don’t know, this is a grit bin. it normally just sits on streets in the UK looking rather sorry for its self, but given a little bit of an art makeover and suddenly people start to take notice of it, and I for one feel rather sorry for it! While this images is a great example of how a normal everyday can recycling dome and a rubbish bin can look amazing I’m sure there is an underline story of how their food is rubbish and should be thrown in the bin rather than eating it. But maybe I am wrong and the artist does in fact just love Mcdonalds so much it inspired them to do this! Are you ready? Ooohhhh….Who lives in a pineapple under the sea? The wheelie bin?!? It has to be said that this strangely seems to work quite well! Turning the bin around revels a different Sponge Bob emotion on all 4 sides and just looks amazing. This is just one of those amazing things you see in the street that everyone looks at and takes pictures of. Seen in California this amazing R2-D2 inspire bin brings a smile to most nerds faces even though underneath it is still just a rubbish bin! Seen in a park in Wiltshire is this rather impressive TARDIS rubbish bin that was made to try to encourage the local people to put there rubbish into it. I have no idea if the idea worked but it looks amazing anyway and well worth me including it in this list. These amazing mosaic style bins are located in Arcata, California and are in fact part of an art exhibition that happens each and every year and I think they bring a real touch of class to something that people would otherwise walk pass and not notice. Once again we go back to Bristol that seems to be home of some of the greatest bins in the world! And this one I just loved, made out to look like the grit bin has barfed up some grit it’s simple to do yourself and simply brings a smile to your face and that is what life is all about. 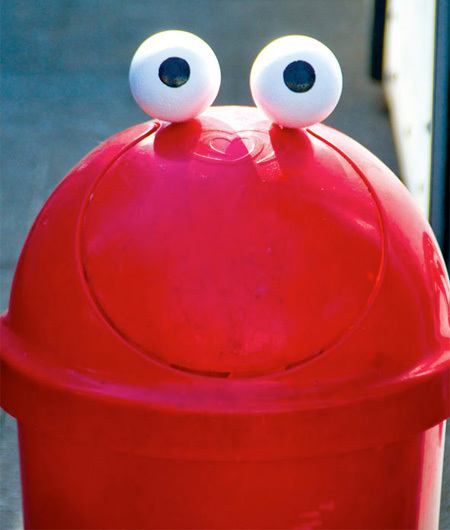 German Timm showed off his love of Sesame Street by using a bright blue public bin and a pair of eyes and made it look just like Cookie Monster! It is said to have gone viral and brought a smile to the face of millions of people who pass it each and everyday in New York. 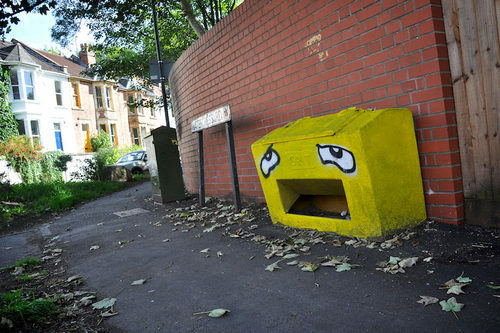 Funny, simple, genius, but yet underneath it is just a garbage bin.